Home | Displays and Exhibits, Inc.
No sales tax and free ground shipping means we guarantee that the price you see on the product page is the price you’ll see at checkout. Enjoy FREE Ground Shipping on all orders to the contiguous United States – no minimum required! The “Made in USA” stamp is a symbol for a premium product of superior quality. We reflect these values with our own, in-house production team based in the USA. From product browsing to shipping, we’ve streamlined our entire process to create a simple and seamless shopping experience. The pop-up display is a staple of the trade show industry and has been the go-to choice for both first time exhibitors and seasoned veterans for years. Portable, easy-to-assemble, and available in a variety of sizes, there’s no reason to not have one of these in your trade show arsenal. High-quality and stretchable printed fabric covers pulled over a quick assembling, sturdy aluminum frame or wall. These displays are versatile, lightweight and durable. Great for indoor and outdoor events. Available in straight and curved options. Whether you’re exhibiting at a trade show or simply announcing the latest lunch special at your restaurant, banner stands are a great way to advertise without breaking the bank. Browse our catalog of retractable and non-retractable banner stands, as well as our feather flags and event tents. Say ‘goodbye’ to messy product tables and roll racks! Slatwall displays are the perfect solution for displaying your products anywhere! From the trade show booth to outdoor events, slatwall displays offer endless configurations and are portable, lightweight and extremely durable. No trade show booth is complete without accessories. From chairs to table covers and shipping cases to parts and components, we have you covered! Browse our catalog of trade show accessories. A hanging sign is the cherry on top that brings everything in your exhibit together. 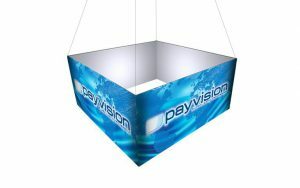 This lightweight sign hangs just above your booth and serves as a beacon to guide attendees to your location. Choose from dozens of sizes and styles. Select a product from our extensive catalog of portable event displays and branding materials. Add the product to your shopping cart and checkout using our quick and easy-to-use checkout system. Download your product's graphic template. Once you've prepared your artwork, simply log into your account and upload the files through your account dashboard. Our seasoned in-house production team will print, cut, sew and prepare your products for shipping. Production lead time averages 3-5 business days after artwork approval. Ship to any location of your choice, whether it's your business, trade show or advanced warehouse. Receive FREE ground shipping on any order, no minimums!